KMb Resources – Mobilize This! While busy brokering and building capacity for knowledge mobilization York’s Knowledge Mobilization Unit has also been publishing peer reviewed articles on their practice. These 10 publications (and more are on their way) are posted in the Knowledge Mobilization community of York’s institutional repository. This new monthly post will feature a different article and the accompanying ResearchSnapshot clear language research summary. Tout en travaillant au courtage des connaissances et au renforcement des capacités de mobilisation, le service de MdC de York a publié, dans des revues avec comité de lecture, des articles portant sur ses pratiques. Ces dix publications (d’autres suivront bientôt) sont accessibles à partir de la page thématique de la MdC, dans les archives informatiques de York. Cette nouvelle parution mensuelle sera composée d’un article accompagné de sa capsule “FlashRecherche” – un résumé vulgarisé des travaux présentés. What you need to know. When research is easier to access, it supports closer collaboration between the different groups that are affected by it. Universities, communities, government agencies and businesses can improve their collaboration with other sectors to apply research findings to real world problems and maximize the impacts of research. What is the research about? Knowledge mobilization (KMb) and social innovation gets university research into the hands of policy makers, businesses, and community groups. These stakeholders increase the social, economic and environmental impacts of research by using it to improve the wellbeing of people and our planet. Thus, research must speak to different industries and communities to see its effect on the social economy. A stronger social economy can emerge if we work together, finish projects, join knowledge, and set goals. This study explains the relationship between people doing research, people who need that research, and its relevance to society. KMb and social innovation finds ways to collaborate and communicate it to make the world a better place. What did the researchers do? The authors studied literature and practices in universities, community groups, and the government. They wanted to see how effectively research was being used after it was completed. They reviewed social innovation trends and suggested ways to make research easier to access and understand for these stakeholders. Train and create a community of KMb and social innovation leaders and practitioners and stay connected. How can you use this research? Businesses may use this research to improve innovation and social enterprise through access to research. Policy makers may consider developing a strategy to improve relations with universities through KMb. Academic researchers may also use this work to leverage investment in their research and maximize social innovation through their findings. Community groups can access research easily and use it to improve current and future programs and services. Community-based research also becomes more accessible to different universities when partnered with universities through KMb. 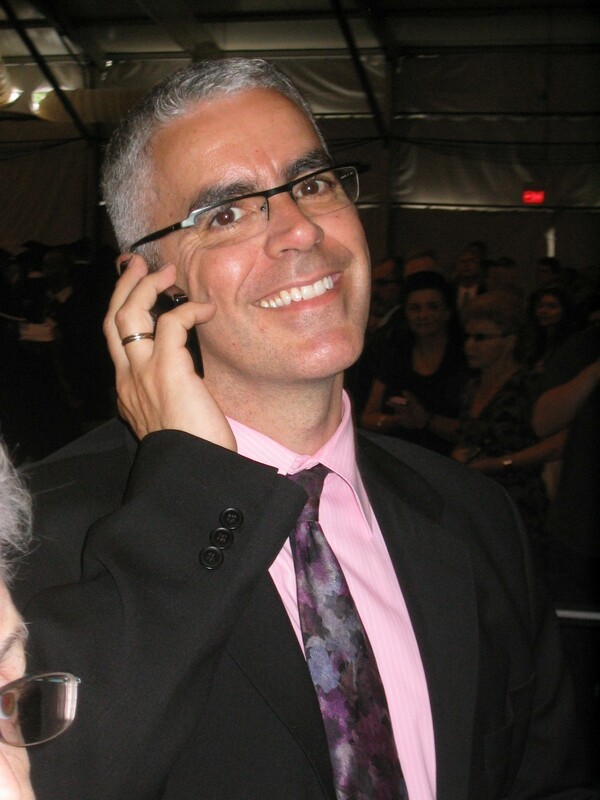 About the Researchers: David Phipps is Executive Director, Research & Innovation Services at York University. Naomi Nichols is a Research Associate for York University and the Canadian Homelessness Research Network. Johanne Provençal is the Acting Director, Strategic Initiatives, Office of the Vice President Research Innovation at the University of Toronto. Allyson Hewitt is the Director of Social Entrepreneurship and Advisor of Social Innovation for SIG@MaRS Discovery District located in Toronto, Ontario. Reference: Nichols, N., Phipps, D., Provencal, J., Hewitt, A. (2013) Knowledge mobilization, collaboration, and social innovation: Leveraging investments in higher education. Canadian Journal of Nonprofit and Social Economy Research, 4(1): 25-42. Blogs, presentations on Slide Share, videos on you tube, twitter, Delicious bookmarks, Linked In but not facebook. These are our social media tools and now we have published a book chapter reflecting on these tools and their application to knowledge mobilization. Blogues, présentations sur SlideShare, vidéos sur YouTube, signets Delicious, LinkedIn (mais pas Facebook), voici les outils que nous utilisons sur les médias sociaux. Nous avons publié un chapitre de livre qui présente ces outils ainsi que leurs applications pour la mobilisation des connaissances. A few weeks ago Krista Jensen, David Phipps (both from RIR-York) and Gary Myers (www.kmbeing.com) published a book chapter titled “Applying Social Sciences Research for Public Benefit Using Knowledge Mobilization and Social Media”. This was published by the open access publisher, In Tech, in a book titled “Theoretical and Methodological Approaches to Social Sciences and Knowledge Management” that was edited by Asunción López-Varela. These three messages were then illustrated by citing the practices of Institute for Work and Health and PREVNet, both of whom promote the use and uptake of research into policy and practice. In addition to these two Canadian networks these principles were illustrated by three international examples of university based knowledge mobilization activities: Community University Partnership Program of the University of Brighton, Research in Action Project of the Institute for Health Policy at the University of Texas and the Centre for Families and Relationships at the University of Brighton. 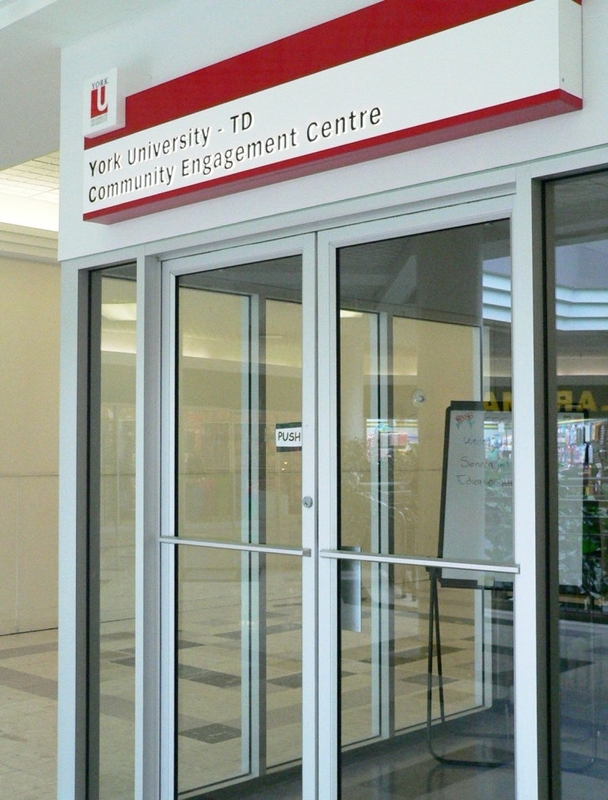 The chapter then presents in detail the knowledge mobilization services of York’s Knowledge Mobilization Unit. Drawing on our “recipe book” published in Scholarly & Research Communications in December 2011 we go further to present some success stories arising from our work: United Way York Region Strength Investments, Parkdale Activity & Recreation Centre Heat Registry, Green Economy Centre of South Simcoe and Evaluation of the Inclusivity Action Plan of the Regional Municipality of York. Just do it / Faites le! David Phipps has taken a break to read some journal articles that have been piling up. Reading about the science of knowledge mobilization is good. Getting out and actually mobilizing knowledge is better. David Phipps a pris une pause pour lire quelques articles de journaux qui s’étaient empilés. Lire sur la science de la mobilisation des connaissances, c’est bien. Sortir et vraiment mobiliser les connaissances, c’est mieux. I had some time to sit back and read some recent issues of Evidence and Policy and came across the following article- Adrian Cherney and Brian Head (2011) Supporting the knowledge-to-action process: a systems-thinking approach. Evidence and Policy. 7(4): 471-488. Cherny and Head developed a holistic model supporting the knowledge-to-action (KTA) process based on systems thinking. 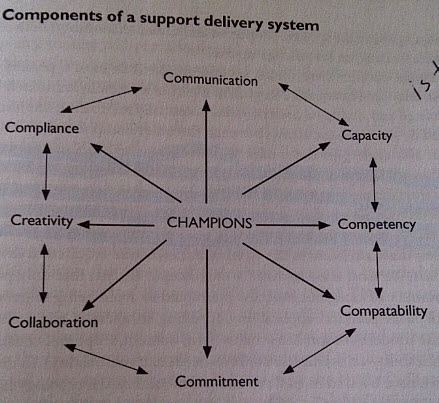 It is based on 9 C’s: communication, capacity, competency, compatibility, committment, collaboration, creativity, compliance, champions (see figure). Like the Promoting Action on Research Implementation in Health Services (PARiHS) framework (see below), this is another model that helps practitioners think about our practie but it is not a practice per se. Cherny and Head say, “We have purposely focused on the principle and processes that should underpin a support system for enhancing the KTA process. While infrastructure is central to the delivery of such support it is important to specify principles rather than physical activities because we want to highlight the building blocks for an effective support system relevant across a range of contexts.” Cherny and Head are explicitly saying that they chose to focus on thinking about it rather doing it. It reminded me of a recent article in Implementation Science- Cheryl B Stetler, Laura J Damschroder, Christian D Helfrich and Hildi J Hagedorn (2011) A guide for applying a revised version of the PARIHS framework for implementation. Implementation Science. 6(99). The PARiHS framework was developed to help understand those elements that contribute to successful implementation of evidence into practice in health care settings. The PARiHS framework is a function of the interplay of three core elements: 1) the level and nature of the evidence; 2) the context or environment into which the evidence is to be placed; and 3) the method or way in which the process is facilitated. By 2010 there had been 32 papers published on the PARiHS framework, but according to Stetler et al (2011), “No published studies were identified that used the framework comprehensively and prospectively to develop an implementation project. The ability to fully evaluate its usefulness thus has been limited.” The authors mean that this framework is a way of thinking about practice, not a practice per se. For more on the PARiHS framework see the KMb Journal club post. It must be nice to be able to think about something and never have to do it. But then that’s the role of researchers in many fields. Researchers think about things and study things without actually doing the things they study. Then there’s the role of practitioners. We do things without having incentives or rewards (ie the time) to sit back and think about and reflect upon what we do. I wrote about this on February 1, 2012 when I wrote that we were all knowledge hypocrites. We need more mobilization of knowledge about knowledge mobilization. Researchers need to move beyond thinking about frameworks to working with practitioners who are putting those frameworks into practice. Practitioners likewise need to embed researchers in their practice. At York we are starting a conversation among our engaged scholars and knowledge mobilization projects and their embedded knowledge brokers. Our goal is to inform our practice by working directly with our researchers. That’s also what the Canadian Knowledge Mobilization Forum will start to address. By mixing knowledge mobilization researchers and practitioners it will sow the seeds of mutually beneficial researcher-practitioner relationships. Join many of your knowledge mobilization colleagues in Ottawa on June 19-20. I have also written that what we do as knowledge brokers isn’t rocket science (see point #2 in a recent journal club). Knowledge brokering is as much common sense as it is implementation of frameworks. But these frameworks are the opposite, presenting complicated inter-relations of elements, stages and components all designed to maximize the impact of research and evidence on decision making without ever having been evaluated to see if the outcomes support that design. If I had to think of all the elements and sub elements of the PARiHS framework and all 9 C’s of the systems thinking model before addressing any knowledge mobilization opportunity I would be paralyzed, unable to figure what to do first. I read the literature. I engage with researchers. That is important, for sure. And then I just do it.